A nice Big Bend redfish! Whenever anyone asks me to recommend some Gulf fishing waters that are protected from early winter winds, the Shell Mound backwaters north of Cedar Key always seem to top my list. 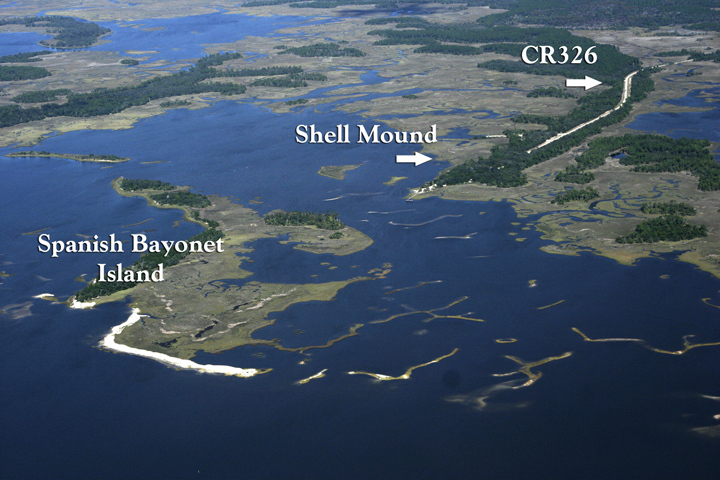 Located about 10 miles north of the town of Cedar Key and halfway to the town of Suwannee, Shell Mound offers visitors not only a nice campground, but two boat ramps, a small fishing pier and even an interesting archaeological site. The rugged Gulf shoreline between Cedar Key and the Suwannee River gives unlimited opportunities to anglers, especially those in shallow-draft skiffs, canoes or kayaks. The scenery’s not bad either, and a trip here will give you a look back in time to when Timucuan Indians ate enough shellfish, mostly oysters, to leave a 28-foot high midden mound near what’s now the site of a boat ramp. 3500 years isn’t a long time in the overall scheme of things, and I suspect the creeks and islands seen here today are much the same as when the Timucuan plied these waters. Oysters still abound in these waters and their presence support an excellent year-round fishery. And cooler November days usually signal the peak of the action. I don’t know if anyone’s ever counted the number of islands and shell bars in this area, but I’m sure there are more potentially good inshore fishing spots than any angler might fish in a lifetime. Not only are there bars and islands right up against the almost indefinable shoreline and in creek mouths, but there are layers of barrier bars extending on a north-south line as much as three or four miles to the west. Just one example is Deer Island (N29 14.177 W83 04.785), about 2 miles north of the outside Shell Mound boat ramp. This island straddles the front of an oyster-strewn bay at the mouths of Giger and Clark Creeks. If you head west about a mile from the shoreline of the island, you’ll be atop the Lone Cabbage Reef. Another three miles and you’ll be at the north end of the Ranch Bars—and still in less than six feet of water. It’s these bars and reefs, and others like them along this stretch of coast that slow the action of the wind and waves, making backwater fishing popular here in almost any situation. In fact, I often wonder just why anyone would even want to fish the deeper water here in the fall when there are all those redfish, trout and black drum infesting the backwaters. A couple of my favorite backwater spots here are The Preacher Hole (behind Deer Island at N29 14.000 W83 04.001 or near the bars in the back of Little Trout Creek at N29 15.640 W83 04.283. November marks a turning point for shallow-water redfish and sea trout fishing along the Big Bend. By now, there have been enough cold fronts come through to significantly cool the waters. This cooling signals redfish that have reached spawning size, usually top-slot or slightly above, to school up and begin their journey to deeper waters. These reds are often found tailing along the fronts of bars, particularly those in front of creeks, on falling tides. Smaller specimens tend to move into creeks and into deep holes in order to say warm during the upcoming winter. That’s not to say that you won’t catch reds on the lower end of the ‘slot’ on the outside, but expect them to be inside, many times sharing space with schools of ‘keeper’ sea trout. Expect to find your big ‘gator’ trout on the outside of creeks, too, but it won’t be until later into the winter before they start to really gather up. In November, expect to find those big girls, in search of fodder that’s rich in protein (usually mullet), foraging solo—and very spooky! November’s cooler weather means hungry, active fish. And while live finger mullet, cut mullet, mud minnows (killifish) and shrimp are the choice baits of local anglers, the Shell Mound area is a great place to toss artificial lures. Of course, you must maneuver your boat quietly and maintain a certain degree of stealth. That means using your push pole or trolling motor—and NOT slamming hatches or cooler lids. Or, even better, use your kayak or your canoe. Good artificial choices for both trout and reds include 3-inch D.O.A. shrimp (which work well fished under popping corks), D.O.A.’s 5.5-inch Big Fish Lure (Stark Naked) or a MirrOlure 16MR Surface Walker (with a red head, of course!). Anglers can expect all of Florida’s Big Bend to come alive with game fish as waters cool in November, especially following this past summer’s uncomfortably hot weather and water temperatures. So, if you’re interested in lots of fishing action mixed with some beautiful ‘natural north Florida’ scenery, you owe it to yourself to give the 10-mile stretch of shoreline between the Suwannee River and Cedar Key a try.